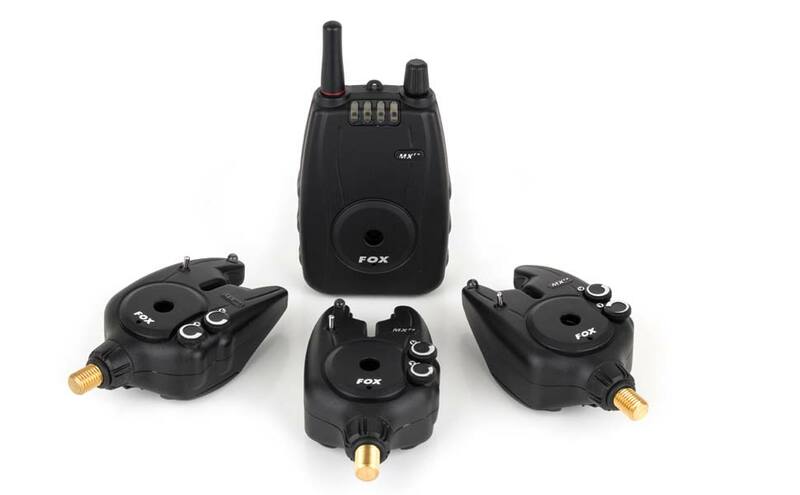 For those of you that love the Mr+ sets but desire higher specifications you’ll be pleased to hear that Fox have launched the MXr+ alarms that also feature the built-in I-Com Transmitter Technology that makes them compatible with the MXr+ Receiver. The MXr+ alarms share many features in common with the Mr+ such as weatherproof sealed case, top quality digital circuitry, low battery drain, D-Tec Sensing System, CNC machined ‘Tru Run’ roller wheel, adjustable volume and a power out socket but in addition you will also find adjustable Tone and a Dual Step Sensitivity control, allowing you to make the alarm more or less sensitive depending on the situation you are faced with. The Mxr+ alarms also feature a top quality Cone Speaker for enhanced sound quality. As with the receiver on the Mr+ Fox have achieved ranges in excess of 200m in testing but are keen to re-iterate that they do not condone anglers being so far away from their rods. This signal strength is purely in place to ensure that no matter what the weather conditions or terrain of your swim you will get a clear signal transmitted back to your receiver at all times when in and around your swim. Both Mr+ and MXr+ presentation sets come supplied in a hardwearing plastic case with foam inserts. They also come supplied with a screw driver and receiver lanyard.